Half Dutch - Sint Maarten, and half French - Saint Martin, this island's beaches are beautiful all the way around the coastline. The Dutch side has the international airport, cruise ship port and duty free shopping, while the French side is slightly more chic and less frenetic. 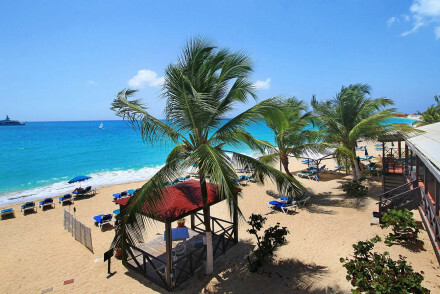 You can find the best places to stay in St Martin on both sides of the island, it all depends on the kind of Caribbean break you're yearning for. Sint Maarten's capital Philipsburg and Simpson Bay, the main tourist area, are where you'll find the shopping centres - Sint Maarten probably has the best shopping in the Caribbean, plus casinos and tourist-friendly nightlife. There are also a number of excellent restaurants. Much of the Dutch side sprouts waterfront resorts and condo communities, but if you're looking for something quieter try the far end of Simpsons Bay Beach, where there are a handful of cool spots. It's quite fun to cross the border back and forth - the challenge is in finding it! Saint Martin's territory covers the northern two thirds of the island, and the majority of the island's natural treasures. Here you'll find the spectacular bluffs overlooking the ocean, the prettiest secluded coves and the lushest interior. Its capital Marigot has the marina and shopping, but if you're staying on the French side you're better off being on the beach. There are scores of good restaurants to choose from on the French side of the island. The Yoda Guy Movie Exhibit is a fantastic family day out, home to a wide variety of movie relics and props from Star Wars special effects designer Nick Maley. There are also lifecasts of a range of historical figures, so you're bound to love spending a few hours wandering around here. If you're looking for some more conventional art then pass through the Roland Richardson Art Gallery or the Tropismes Gallery. The Butterfly Farm is a wonderful spot to visit, filled with hundreds of rare and exotic butterflies fluttering around freely! Take a quick tour and learn all about the butterfly's life cycle before relaxing in the garden or enjoying a coffee in the cafe. Whilst Saint Martin has plenty of fantastic beaches, we'd recommend in particular the white sands and turquoise waters of Mullet Bay and Maho Beach. Our selection of the best places to stay in St Martin embraces both French and Dutch areas and ranges from bargain properties in Philipsburg to one of the best hotels in the entire Caribbean. French Esmeralda is a beachside hotel for those who appreciate a bit of boutique chic, but nothing too fussy. Spacious and whitewashed, most rooms face the ocean or the large central pool. There's a choice of restaurants, including one on the beach and one fine dining option. The Bleu Emeraude has just 11 contemporary chic rooms, but they range in size up to two bedroom suites, complete with kitchens, living areas and all the mod. cons. a modern family needs. As well as being close to the beach, guests have incredible views over the bright blue Caribbean to Anguilla. 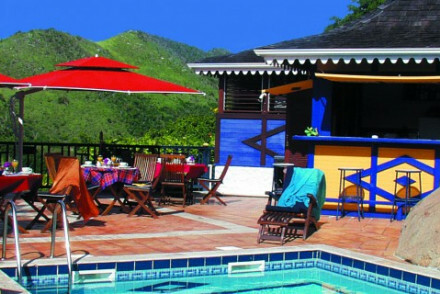 The Oyster Bay Beach Resort is beautifully located, right on the border of the French and Dutch sides of the island, and full of Caribbean character. Penthouses have fully equipped kitchens and balconies complete with BBQs. This is a large and lively resort which also has its own nightclub, as well as restaurants and bars. La Vista Beach Resort is ideal for families on a budget, boasting one and two bedroom apartments directly on the beach. There's a large swimming pool to boot, plus you're walking distance to a wide range of activities and restaurants. The Hotel La Plantation near Saint Martin's Orient Beach is an excellent four star hotel with a good range of suites and two bedroom villas for families to choose from. You're right on the beach, but there's a nice pool too, and plenty of restaurants nearby. The Pasanggrahan Hotel is a cheerful, historic looking guesthouse on the opposite side of the island, in the capital, Philipsburg. It's also right on the beach, offering a range of room and suite sizes - three of which have kitchen facilities. It's also very reasonably priced, with rooms from only £61 per night. 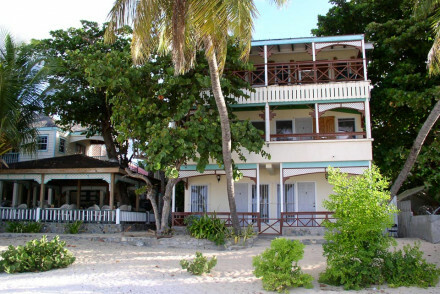 Divi Little Bay Beach resort is a large resort on its own peninsula, boasting private beach access. It's also got three pools, one which is just for kids, as well as three restaurants and a spa. Horny Toad offers a collection of self-catering beachside apartments - ideal for families who fancy a bit of privacy. A decent value stay. 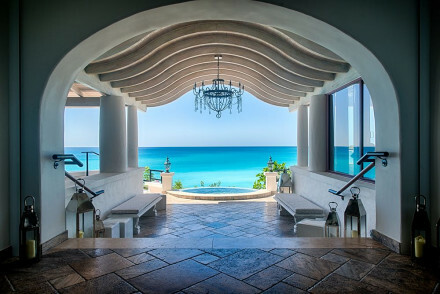 La Samanna, on the French side, is not only one of the best places to stay in St Maarten but probably in the whole of the Caribbean! A luxurious spot, done with great taste and all the mod. cons.. It's got facilities for all and its own private beach. Another romantic spot on the French side of the island is L'Esplanade. With just 23 rooms, including several lofts and a two bedroom villa with its own infinity pool, this boutique hotel is romantic, laid-back and beautiful, yet unpretentious. The Hotel Marquis is a small and elegant four star boutique hotel with beautiful views and a serene location. There's also a top of the range spa. Mary's Boon, located on Simpson's Bay, is a great value option which offers more sophistication than you'd expect for the room rate - starting at just £46 per night. It also has direct access to the beach. Holland House in lively, central Philipsburg has great facilities and stunning views over the bay. The decor in its 55 rooms is city chic and you're close to the main attractions of Philipsburg. 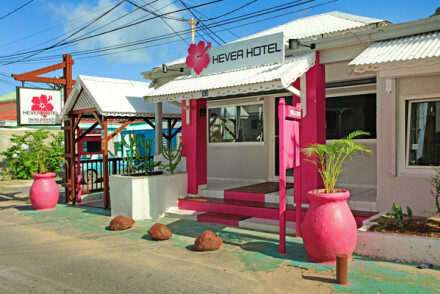 The Hevea Hotel is a good value choice on the French side of the island, with just ten large and bright rooms, plus a lovely sun deck. You're just a short walk from the beach, and the room rate starts at as little as £51 per night. Seaview Beach Hotel boasts comfortable rooms, with triples and quadruples available, from £57 per night. You're ideally located to spend your days lounging on the beach or exploring all that Phillipsburg has to offer. 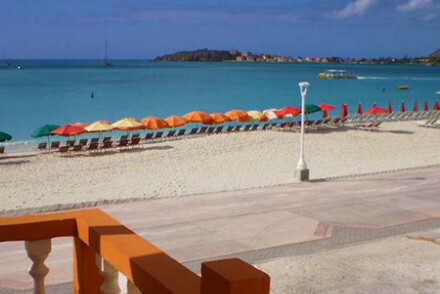 Saint Martin is never cool, with the average temperature hovering around 28°C year round. There's never a huge amount of rainfall, though more occurs from August to November so perhaps bring a jacket if you're visiting at this time. June to November are also the months when hurricanes and tropical storms are more likely to hit. Mid-December to April is peak season, when visitors flee their cooler winter climates in search of some sun and sand. Expect accommodation to be on the pricer side of things and for the place to be fairly busy. International visitors can fly into Princesss Juliana Airport, located on the Dutch side of the island. From here, take a taxi or a shuttle bus on towards your final destination. 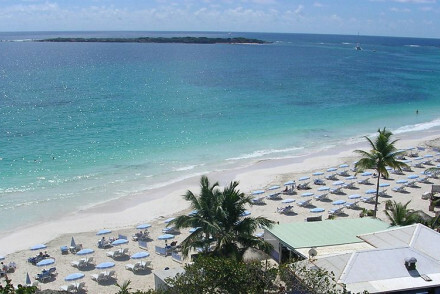 Browse through our list of all the best places to stay in St Maarten. Alternatively widen your search and check out all our Caribbean recommendations. A hotel for the budget minded traveller who appreciates contemporary style and being close to the beach. Large bright rooms, some more romantic than others decked out in light woods and all white bedding. Lovely sun deck and a short walk from the great beach below. Value chic - Beautiful contemporary bedrooms at bargain prices. Fishing - Deep sea fishing is an exciting adventure and the migration period of large fish is awaited with much anticipation every year. Sailing - St Maarten is one of the Caribbean’s leading sailing spots. A very basic B&B type hotel for the budget minded traveller set just off the beach and within walking distance of all Phillipsburg's attractions. Comfortable rooms, terraces, breakfast. Rock bottom prices and rooms that have 1, 2, 3 and 4 beds. An ideal base for families on a budget. A very good beach option for those who enjoy sophisticated interiors. Rooms and suites are boutique with four poster beds, colourful walls, and patios facing the sea. Swimming pool, excellent restaurant & small spa. Direct access to the beach. Ideal for couples and families. Superb value for money. On the beach - Simpson Bay. 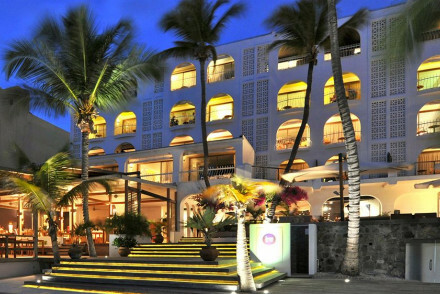 An excellent four star hotel suited to families, foodies, and beach goers alike. Charming rooms, suites, and two-bedrooms villas, all with their own kitchens. Swimming pool, romantic poolside terrace, and plenty of restaurants to choose from on the beachfront or directly on the beach. Families - 2 bedrooms villas are ideal spots for families. Sights nearby - Butterfly Farm. A cheerful and historical guesthouse directly on the beachfront makes an ideal spot for a family, groups of friends, or those on a budget. A range of rooms, suites, and a penthouse (3 bedrooms) have kitchens, balconies, and panoramic views. Steak and seafood restaurant and fishing trips. Families - The penthouse has three bedrooms and a panoramic view from the rooftop. Fishing - The hotel provides deep sea fishing escapades. A small unpretentious collection of apartments directly on the beach. Each unit has its own kitchen, living area, and you can walk directly out of your door onto the beach. No eating options available, but ideal for a couple or family who want to do their own thing. Excellent value. Quirky - A small, unpretentious spot with an excellent reputation. A good value beach resort for those on a budget. A collection of studio and two-room apartments have kitchens, balconies, and sea views. A short walk directly onto the beach or to the large swimming pool. Close to all the restaurants and activities around. An ideal base for families or couples. Views - Fantastic seaviews from all angles. On the beach - Overlooks the crystal waters of Lay Bay. A lively spot with great amenities and stunning views over the bay below. Contemporary chic rooms have all the mod cons and in-room massages. Large wine cellar, pool, bar and restaurant, and easy walking distance to the town's main attractions. A good choice for a family. Views - Fabulous bay views. Sights nearby - Cyrus Wathey Square, Philipsburg Courthouse, and Yoda Guy Movie Exhibit. Lively - A lively venue in the evenings for cocktails. A beachside hotel for those who appreciate a bit of boutique chic. 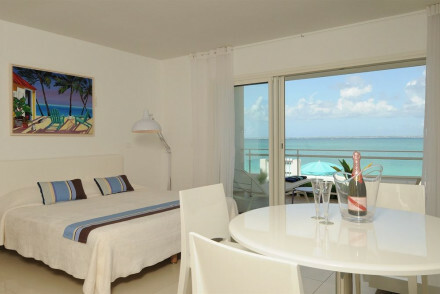 Luxurious rooms, suites, and spacious condos, all with kitchens, white washed walls, and romantic furnishings. 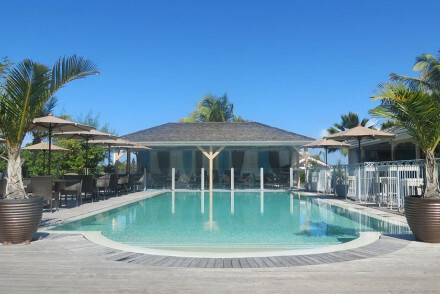 Large central pool, fine dining French restaurant, beach restaurant and direct access to the beach. 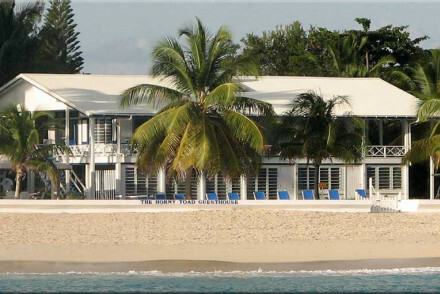 Foodies - The Astrolabe specialises in French cuisine, and the beachfront restaurant serves International food. 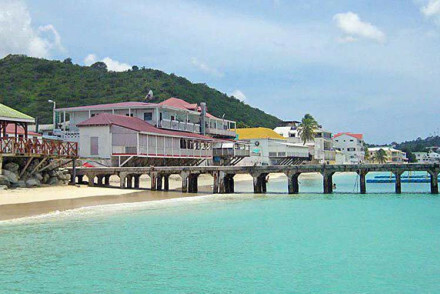 Plenty of Caribbean character and luxurious living on a lively beach resort. Chic rooms, suites, and penthouses have fully equipped kitchens, BBQs and balconies. Swimming pools in tropical settings, ocean vistas, spa and beauty centre, restaurant, and laid back romance. Lively - Beau Beau is a lively night spot at the hotel. A contemporary chic set up with all the mod cons makes for an ideal base for a family beach holiday. Rooms and two bedroom suites all in white have DVD players, iPod docking stations, kitchens, and living areas. A short walk out of the hotel onto the beach. Ideally located for beach life. Sights nearby - Paradise Peak. 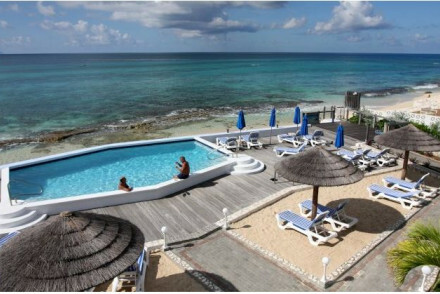 A large and attractive beach hotel with all the amenities on a pretty peninsula; ideal for families and beach goers. Contemporary chic rooms, suites, and family rooms in creams and pastels, three pools (one for kids), three restaurants, a spa, and easy access to the beach. Outstanding location - Set on a peninsula of its own with unrivalled beach access and seaviews. Beach Life - Swimming pools, beaches, and ocean views. A luxurious beach boutique suited to the sophisticated traveller. Four Star comforts and elegant decor throughout; romantic suites with kitchens and living areas. Large pool, top of the range spa, fitness centre, and a gourmet discovery package. Ideal for couples and families. A dreamy little spot and a hidden gem with boutique interiors and varying accommodation. Rooms, lofts, and a two-bedroom villa (with its own infinity pool) with romantic furnishings, a laid back atmosphere, and sea views. Tennis and squash courts on site. Delightfully unpretentious. Luxury - An oasis of tranquility with amazing ocean views and impeccable attention to detail. Honeymoons - A dreamy spot with chic interiors, wonderful views, and a romantic atmosphere. Views - Stunning ocean views and rooftop vistas. The piece de resistance on the French side of St Martin. Luxury for the scrupulous traveller, the honeymooner, a family, or friends. Uber chic rooms, suites, and 3/4 bedroom villas, have all white walls, marble bathrooms and all the mod cons. Three fantastic restaurants, spa, and private beach. 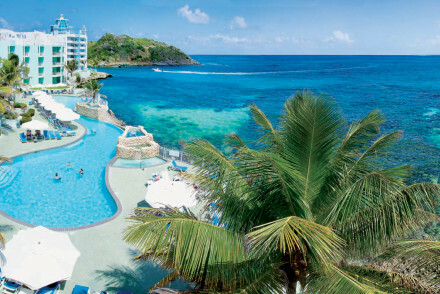 5* Luxury - One of the top 10 Caribbean hotels.